flourishing in your life, work, and relationships? A major reason why people don’t thrive is because we’re focusing on the wrong things―on keeping up rather than waking up to what matters most. 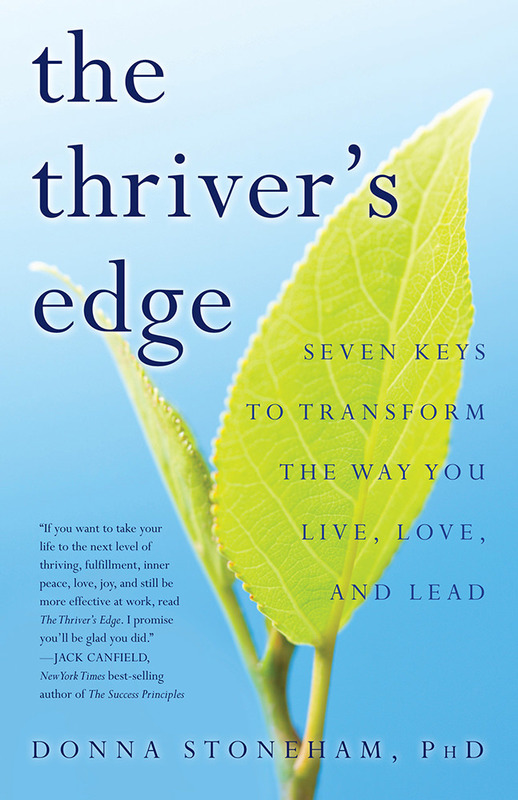 In The Thriver’s Edge, master executive coach and transformational leadership expert Dr. Donna Stoneham uses her powerful THRIVER model to help readers uncover the beliefs and fears holding them back from more fully expressing their gifts. Page by page, Donna explores the many ways to develop and integrate the seven keys—trust, humility, resilience, inner direction, vision, expansiveness, and responsibility—that lead to thriving, illustrating her points with personal stories and inspirational examples of various people who have flourished in the midst of adversity. At the end of each chapter, powerful reflection questions and practices encourage readers to put these seven keys into practice. Practical, practicable, and transformative, The Thriver’s Edge is a “coach in a book” that teaches readers to unleash their potential, fulfill their dreams and offer their best to the world. The Thriver’s Edge is Available Now! If you want to take your life to the next level of thriving, fulfillment, inner peace, love, joy and all the important things we want in life and still be more effective at work, read The Thriver’s Edge. I promise you’ll be glad you did. All too often, we let the busy-ness of every day take over the meaning of our lives. Reading this book will change that; by bringing trust and vision to consciousness, we can live and lead more expansively and successfully than ever. After reading The Thriver’s Edge, you’ll have renewed enthusiasm and purpose for all that you do! In a world dominated by fear-based approaches to success, The Thriver’s Edge offers an inspiring and life-affirming alternative. Donna Stoneham writes with the wisdom of one who has guided many people in manifesting their inner gifts. If you need to do some soul searching to find out how you can live with passion and on purpose, this book will serve as a warm hand on your back. It guides you gently toward the realization of all you can make possible. Dawna Markova, Ph.D., author of I Will Not Die an Unlived Life, and Collaborative Intelligence: Thinking Effectively With People Who Think Differently. In The Thriver’s Edge, Dr. Donna Stoneham has masterfully distilled decades of life experience and professional expertise into seven practices essential to thriving. Skillfully presented in a clear and straightforward way, these practices come alive in all their depth and substance with stories and examples that ring true to the reader’s own experience. Stoneham’s suggestions for developing the seven keys are practical and doable. The series of reflective questions and her sage advice steadily guide readers in their quest to step into a bigger life, express their deepest potential, and become their greatest selves. The Thriver’s Edge poses a powerful question: Consider for a moment how our world be transformed if we supported one another to become the magnificent beings we are designed to be. This book consistently shows us how to do that in ways that support us to thrive, not just survive, which is something the world needs more than ever. The Thriver’s Edge is an inspiring, uplifting, and empowering book grounded in the real world experience of a successful executive coach and transformational expert Dr. Donna Stoneham. Sharing transformational experiences that aid in the learning process, Stoneham provides numerous inquiry practices that offer real takeaway value, and she makes deep concepts meaningful and accessible for the reader. The Thriver’s Edge is well-written, intellectually stimulating, relevant, and spiritually rewarding. Your book was powerful, motivating, and it reinforced some decisions I need to make in my life. After open-heart surgery, my focus was to survive, but now that I’m healthy again, I want to thrive. Life is too short to do otherwise. I read an advance copy of The Thriver’s Edge a few weeks ago. Knowing Donna’s transformative work with leaders and leadership teams and her vibrant and resilient spirit, I knew it would be wise and useful. I hadn’t expected the profound beauty. It is filled with inspiring and touching courageous human stories, hers and people she’s worked with over her career. I’m rereading it as it’s inspiring me to enhance my own life, but it also opens my heart more fully to the human experience and our common humanity. Thank you, Donna, for this incredible gift and model of thriving.